The rotator cuff consists of four muscles: the subscapularis, supraspinatus, infraspinatus and teres minor muscles. These muscles end in short, flat, broad tendons that fuse intimately with the fibrous capsule to form the musculotendinous cuff [Figure 1]. This fusion occurs between approximately half and three-quarters of an inch from the point of the insertion of the tendons into the humerus. Pain, weakness and loss of shoulder motion are common symptoms reported in rotator cuff pathology. Pain is often experienced in the anterolateral part of the shoulder and is exacerbated by activities requiring the arm to be raised overhead. Night pain is a frequent symptom, especially when the patient lies on the affected shoulder. Other patient-related factors (smoking, osteoporosis, hypercholesterolaemia and diabetes) – Several other patient-related factors have been reported to affect rotator cuff tendon healing. Smoking not only increases the risk of rotator cuff tears, but has also been reported to influence rotator cuff tear size. In the elderly, the risk of rotator cuff tears is increased by osteoporosis. Osteoporosis may reduce the anchor-holding property and tendon healing at the tuberosity. Muscle–tendon unit retraction – Tendon retraction, the gap between the greater tuberosity and the tendon edge, is due to either tendon shortening or muscle retraction. Muscle retraction can be defined by utilising the position of the muscle–tendon junction in relation to landmarks on the scapula. An ultrasonography evaluation criterion for diagnosis of a rotator cuff tear is a hypoechoic area that persists in two different planes. A full-thickness tear is defined by a continuous hypoechoic area from the bursal space to the articular surface, thus a complete absence of the tendon [Figure 2]. A partial-thickness tear is diagnosed by a defect on the bursal side of the cuff or a hypoechoic lesion in a mixed hypoechoic and hyperechoic area on the articular side of the cuff., Tendovaginitis of the long biceps tendon shows a hypoechoic, fluid-filled area around the tendon. The criterion for a rupture is the absence of the tendon in the intertubercular groove. In the case of dislocation, the tendon is always found medial to the groove. In magnetic resonance imaging (MRI), the criteria for a rotator cuff tear are increased signal intensity in association with a discontinuity or irregularity of the tendon on T2- and proton density (PD)-weighted images [Figure 3]. A full-thickness tear is diagnosed by a continuous tendon gap that connects the bursal space with the articular surface. A partial-thickness tear shows a high signal intensity in T2-weighted and fat-suppressed PD-weighted images within the tendon substance without retraction of the tendon. Tendovaginitis of the long biceps tendon is diagnosed when an increased signal is present within the tendon sheath on T2-weighted sequences. The biceps tendon is primarily evaluated on the transverse planes. Many studies have compared the accuracy of ultrasonography with that of MRI in the diagnosis of rotator cuff muscle injuries. Ultrasonography has been found to be able to detect different tendon pathologies (tendinitis and partial- and full-thickness tears), in addition to the causal factors. Compared with MRI, the sensitivity of ultrasonography for tendinitis detection has been reported to be 85%, with 86% negative predictive value (NPV) and 90% accuracy, while for partial-thickness tears, its sensitivity, specificity, positive predictive value, NPV and accuracy were 88%, 89%, 94%, 80% and 83%, respectively. However, for full-thickness tears, the sensitivity and specificity of ultrasonography were both 100%. Therefore, ultrasonography and MRI yielded comparably high sensitivity for detecting full-thickness rotator cuff tears. Ultrasonography performed better in detecting partial-thickness tears, although the difference was not significant. Full-thickness rotator cuff tears can be identified using ultrasonography and MRI with similar accuracy. However, as ultrasonography is less expensive, less time-consuming, more dynamic and less demanding for patients, it should be used as the first line of investigation for rotator cuff tears, when appropriate skills are available. On the other hand, ultrasonography is the most operator- dependent imaging method for the shoulder  and is often considered inferior to MRI for pre-operative imaging because it provides less detail on morphological changes in the rotator cuff musculature. Study findings  have shown little agreement between MRI and ultrasonography in characterising full-thickness rotator cuff tears. Ultrasonography has been shown to have lower interobserver reliability and decreased measurement of large rotator cuff tears. Rotator cuff treatment ranges from conservative treatments such as rest, ice and physical therapy to intra-articular injections or even surgery if the injury is severe and involves a complete tear of the muscle or tendon. With the advent of arthroscopy, innovative shoulder surgeons found that a few small incisions in the skin and deltoid muscles surrounding the shoulder joint could enable access to every part of the rotator cuff. These incisions are small enough to not affect the function of the deltoid muscle or injure its origin on the acromion. Using the arthroscope and instruments specifically designed for the purpose of manipulating and repairing the tissue, the surgeon can work from any angle around the tissue [Figure 4]. Ultrasonography and MRI are comparable in both sensitivity and specificity for the diagnosis of rotator cuff tears. However, ultrasonography shows consistently low reliability in detecting subtle, but clinically important, degeneration of the soft-tissue envelope. As ultrasonography is less expensive and more widely available than MRI, it may be the best modality for identifying tears and could be considered the most appropriate screening method when rotator cuff integrity is the main question, provided that well-trained radiologists and high-resolution equipment are available. However, MRI is superior in surgical planning for larger tears and provides much more information about the prognostic factors. Rabou AA. Complete tear of Supraspinatus Tendon. Radiopaedia. Available from: https://www.radiopaedia.org/cases/complete-tear-of-supraspinatus-tendon. [Last accessed on 2017 Apr 01]. Murrell GA, Walton JR. Diagnosis of rotator cuff tears. Lancet 2001;357:769-70. Teefey SA, Middleton WD, Yamaguchi K. Shoulder sonography. State of the art. Radiol Clin North Am 1999;37:767-85, ix. Seibold CJ, Mallisee TA, Erickson SJ, Boynton MD, Raasch WG, Timins ME, et al. Rotator cuff: Evaluation with US and MR imaging. Radiographics 1999;19:685-705. Holmgren T, Björnsson Hallgren H, Öberg B, Adolfsson L, Johansson K. Effect of specific exercise strategy on need for surgery in patients with subacromial impingement syndrome: Randomised controlled study. BMJ 2012;344:e787. Brand RA. Surgical anatomy of the rotator cuff and the natural history of degenerative periarthritis. Clin Orthop Relat Res 2008;466:543-51. Malanga GA, Visco CJ, Bowen JE. Rotator cuff injury clinical presentation. Medscape. Available from: http://www.emedicine.medscape.com/article/92814-clinical. [Last accessed on 2017 Apr 01]. Carbone S, Gumina S, Arceri V, Campagna V, Fagnani C, Postacchini F, et al. The impact of preoperative smoking habit on rotator cuff tear: Cigarette smoking influences rotator cuff tear sizes. J Shoulder Elbow Surg 2012;21:56-60. Charousset C, Bellaïche L, Kalra K, Petrover D. Arthroscopic repair of full-thickness rotator cuff tears: Is there tendon healing in patients aged 65 years or older? Arthroscopy 2010;26:302-9. Pandey V, Jaap Willems W. Rotator cuff tear: A detailed update. Asia Pac J Sports Med Arthrosc Rehabil Technol 2015;2:1-4. Mihata T, Watanabe C, Fukunishi K, Ohue M, Tsujimura T, Fujiwara K, et al. Functional and structural outcomes of single-row versus double-row versus combined double-row and suture-bridge repair for rotator cuff tears. Am J Sports Med 2011;39:2091-8. Gulotta LV, Nho SJ, Dodson CC, Adler RS, Altchek DW, MacGillivray JD, et al. Prospective evaluation of arthroscopic rotator cuff repairs at 5 years: Part II – Prognostic factors for clinical and radiographic outcomes. J Shoulder Elbow Surg 2011;20:941-6. Cho NS, Rhee YG. The factors affecting the clinical outcome and integrity of arthroscopically repaired rotator cuff tears of the shoulder. Clin Orthop Surg 2009;1:96-104. Meyer DC, Farshad M, Amacker NA, Gerber C, Wieser K. Quantitative analysis of muscle and tendon retraction in chronic rotator cuff tears. Am J Sports Med 2012;40:606-10. Patel MS. Rotator cuff tear. Radiopaedia. Available from: https://www.radiopaedia.org/cases/rotator-cuff-tear-4. [Last accessed on 2017 Apr 01]. van Holsbeeck MT, Kolowich PA, Eyler WR, Craig JG, Shirazi KK, Habra GK, et al. 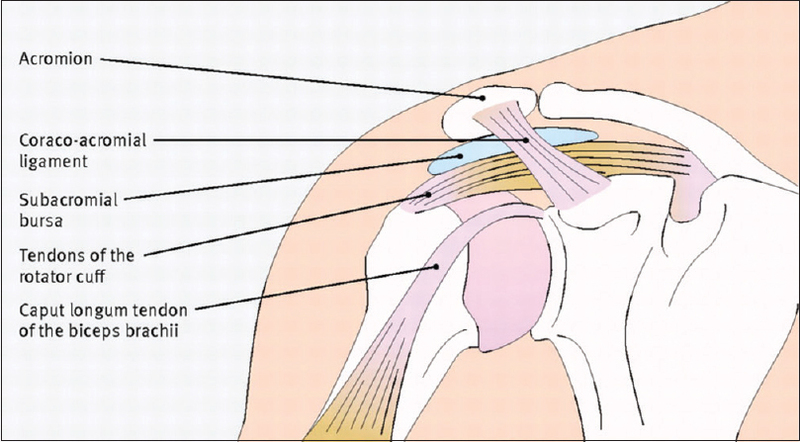 US depiction of partial-thickness tear of the rotator cuff. Radiology 1995;197:443-6. Teefey SA, Hasan SA, Middleton WD, Patel M, Wright RW, Yamaguchi K, et al. Ultrasonography of the rotator cuff. A comparison of ultrasonographic and arthroscopic findings in one hundred consecutive cases. J Bone Joint Surg Am 2000;82:498-504. Fischer CA, Weber MA, Neubecker C, Bruckner T, Tanner M, Zeifang F, et al. Ultrasound vs. MRI in the assessment of rotator cuff structure prior to shoulder arthroplasty. J Orthop 2015;12:23-30. Naredo AE, Aguado P, Padrón M, Bernad M, Uson J, Mayordomo L, et al. Acomparative study of ultrasonography with magnetic resonance imaging in patients with painful shoulder. J Clin Rheumatol 1999;5:184-92. Sarayaa S, Bakryb RE. Ultrasound: Can it replace MRI in the evaluation of the rotator cuff tears? Egypt J Radiol Nucl Med 2016;47:193-201. Rutten MJ, Spaargaren GJ, van Loon T, de Waal Malefijt MC, Kiemeney LA, Jager GJ, et al. Detection of rotator cuff tears: The value of MRI following ultrasound. Eur Radiol 2010;20:450-7. Naqvi GA, Jadaan M, Harrington P. Accuracy of ultrasonography and magnetic resonance imaging for detection of full thickness rotator cuff tears. Int J Shoulder Surg 2009;3:94-7. Alavekios DA, Dionysian E, Sodl J, Contreras R, Cho Y, Yian EH, et al. Longitudinal analysis of effects of operator experience on accuracy for ultrasound detection of supraspinatus tears. J Shoulder Elbow Surg 2013;22:375-80. Sipola P, Niemitukia L, Kröger H, Höfling I, Väätäinen U. Detection and quantification of rotator cuff tears with ultrasonography and magnetic resonance imaging – A prospective study in 77 consecutive patients with a surgical reference. Ultrasound Med Biol 2010;36:1981-9. Okoroha KR, Mehran N, Duncan J, Washington T, Spiering T, Bey MJ, et al. Characterization of rotator cuff tears: Ultrasound versus magnetic resonance imaging. Orthopedics 2017;40:e124-30. Mayo Clinic Staff. Treatment. Available from: http://www.mayoclinic.org/diseases-conditions/rotator-cuff-injury/diagnosis-treatment/treatment/txc-20128411. [Last accessed on 2017 Apr 01]. University of Washington Orthopedics and Sports Medicine. 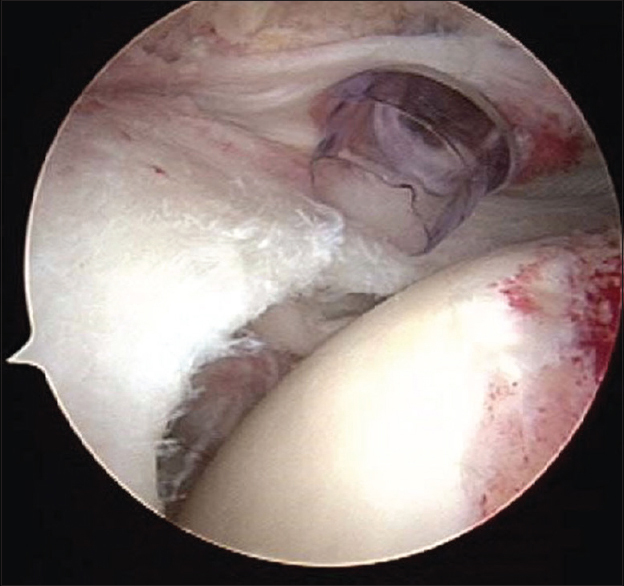 Arthroscopic Shoulder Surgery for the Treatment of Rotator Cuff Tears. Available from: http://www.orthop.washington.edu/?q=patient-care/articles/sports/arthroscopic-shoulder-surgery- for-the-treatment-of-rotator-cuff-tears. [Last accessed on 2017 Apr 01]. Nogueira-Barbosa MH, Volpon JB, Elias J Jr., Gerson M. Diagnostic imaging of shoulder rotator cuff lesions. Acta Ortop Bras 2002;10. Available from: http://www.orthop.washington.edu/?q=patient-care/articles/sports/arthroscopic-shoulder-surgery-for-the-treatment-of-rotator-cuff-tears. [Last accessed on 2018 Mar 03].